Even though Adobe XD is still relatively new, the reception has been terrific. 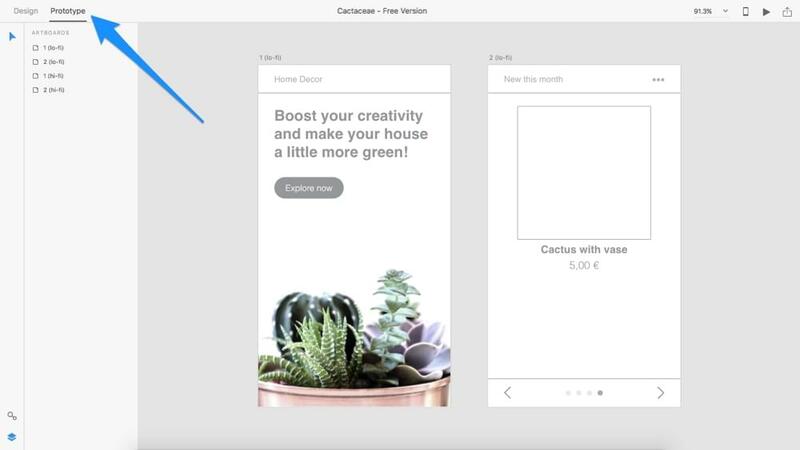 So I thought we’d do a quick-but-fun tutorial that illustrates how designing and prototyping with Adobe XD is wonderfully rolled into a single tool, without making the app feel too bulky. 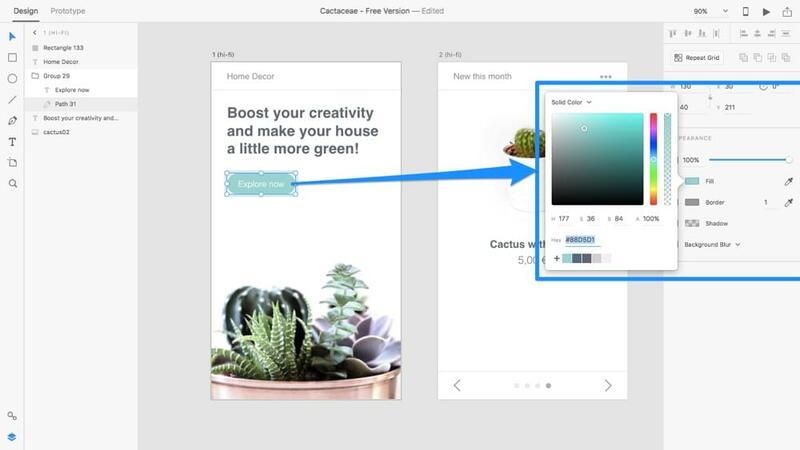 In fact, Adobe XD is pretty minimal and it’s really easy to use once you know how. 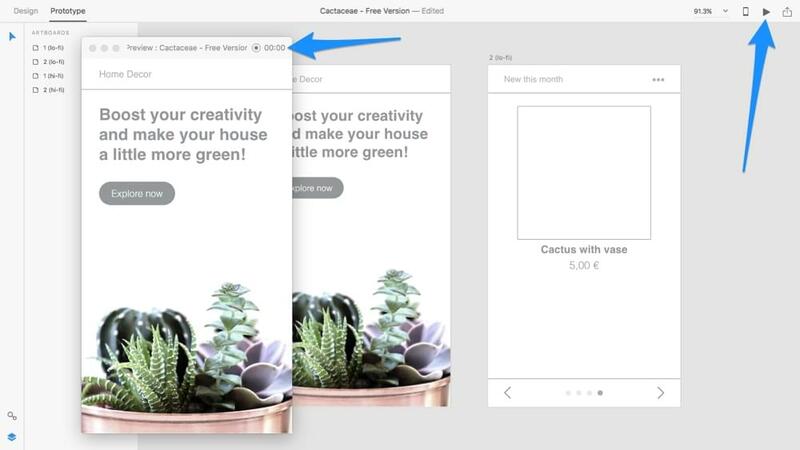 Not too long ago, I compared Adobe XD vs. Sketch. While Sketch is still a brilliant choice for designing user interfaces, Adobe XD came off as the clear winner for those switching from other Adobe apps such as Photoshop or Fireworks. 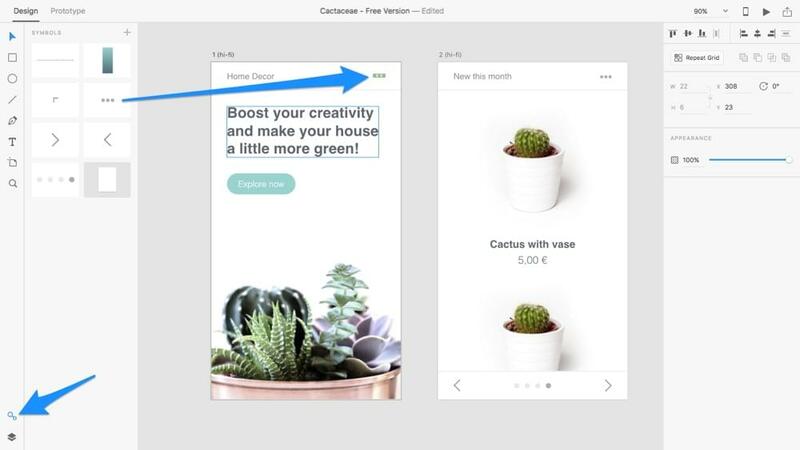 With Sketch you’ll need to install extensions and quite possibly subscribe to third-party services to add any prototyping functionality, whereas Adobe XD offers these tools natively. Plus, if you already have an Adobe Creative Cloud subscription, then you’ll already have the entire feature-set of XD at your disposal! Design + prototyping + feedback all rolled into a single app, what more could you ask for? It’s also available for Windows now! 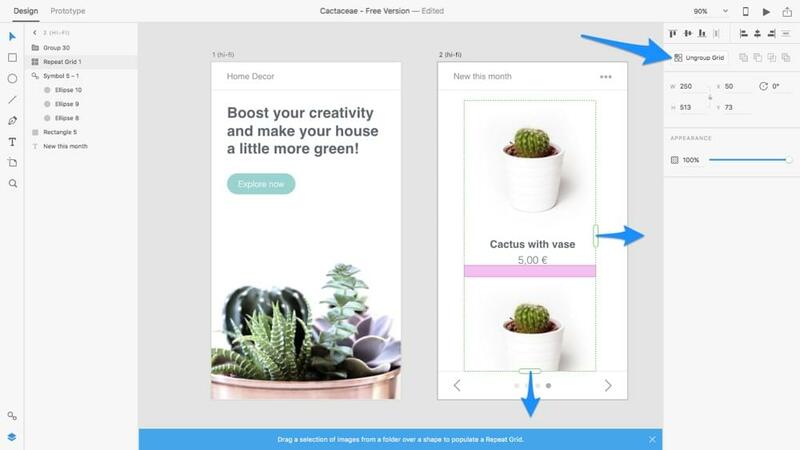 Let’s dive right into Adobe XD by designing and prototyping two screens in a mobile app. Note: the examples used in this tutorial are based on the free Cactaceae UI kit for Adobe XD. Interested to learn about Adobe XD in more detail? Check out our new book, Jump Start Adobe XD! Buy the ebook for $19 or sign up as a Premium member and get it as part of your subscription. You can also grab a physical copy via O’Reily. 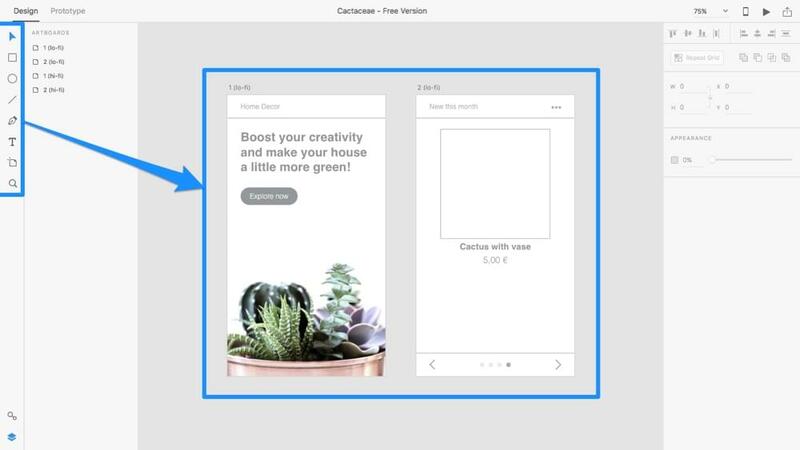 Adobe XD makes it super-easy to quickly mockup a low-fidelity wireframe. Being able to design low-fidelity wireframes quickly means that we can make huge strides towards to creating a layout that offers a terrific user experience, while not having to worry about the visuals too much (at first). Let’s illustrate our first idea so that we can receive feedback from our teammates ASAP — ideas develop faster when there are more brains on deck. Everybody has a design workflow that works for them — when designing low-fidelity wireframes I have a strict rule of using only text and shapes (unless absolutely necessary). What’s the use of designing icons, sourcing images and defining styles for a layout that we might not move forward with? Here are the vital keyboard shortcuts that you’ll need right now. 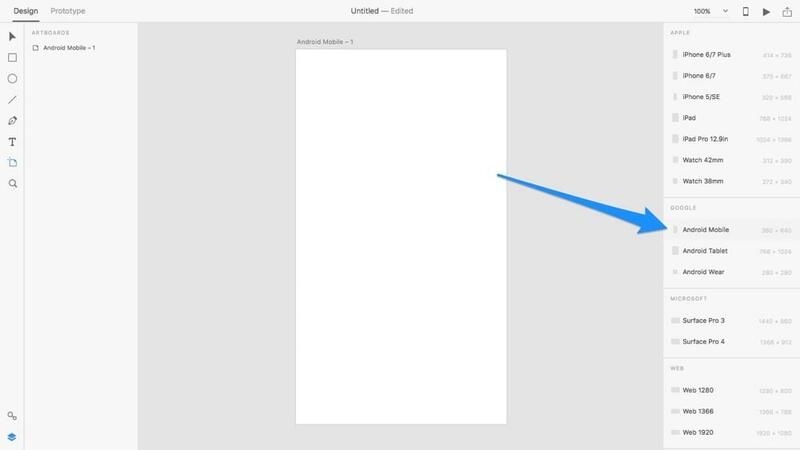 Start by creating an artboard (A) and selecting the “Android Mobile” artboard from the inspector on the right-hand side. Now, using the toolbar on the left-hand side, or the keyboard shortcuts mentioned above, draw some shapes on the canvas to construct your layout. If it adds further clarity, or if there’s any space unaccounted for that makes the layout look confusing, then add maybe one or two images that depict what that space will be used for, as I’ve done below. Very basic icons are fine too, as long as you aren’t wasting copious amounts of time illustrating them. Remember, our aim here is to validate our idea with feedback, only after that should we allocate more time to making it look appealing. If you’re interested to see how rapid iteration compares with Sketch, check out my comparative overview. We now have our rough idea mocked up. It’s time to demonstrate how these two screens might link up — how would the user flow from one screen to the next? I mean, that’s what user interfaces are all about, right? Helping the user from A to B? Switch to the “Prototype” workspace using the tab in the top-left corner. You’ll notice that this workspace doesn’t differ too much from the Design workspace; the main difference that there is no inspector, and when we select objects on the canvas, we’re given the opportunity to link the tap target to another artboard instead of styling them (hence why no inspector). If you’re following along with my example, select the “Explore now” button, where you’ll notice that a blue, draggable handle appears on the right-side side of it. Drag this handle into the neighbouring artboard. Awesome, you’ve created a user flow! In a very short moment we’ll learn how to test this user flow in a real device, but for now, let’s specify the type of transition that the user will experience and how long the animation will last for. Check out my article on easings and animations if you’re interested to know more about them! In our case, choose “Slide Left” for the Transition setting and leave the other settings with their default option. 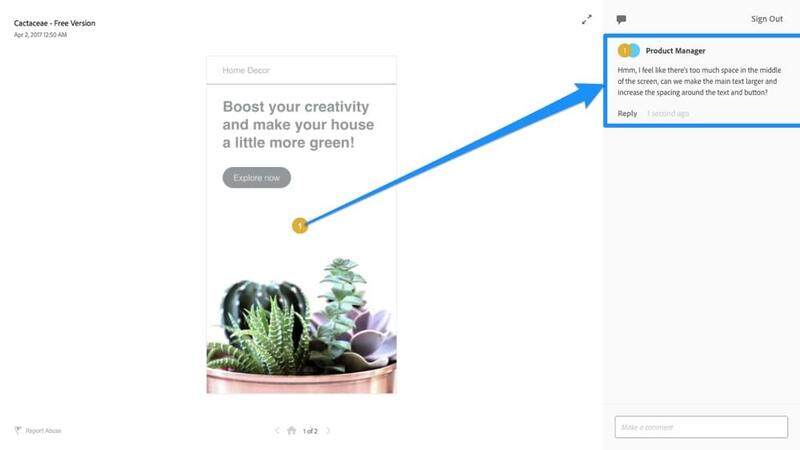 When you’re ready to share your wireframe and receive some feedback, hit the share icon in the very top-right corner of the Prototype workspace window, then click “Create Link”. Next, share this link with your teammates, who will then be able to view the mockup in their browser, make comments on it, and even use their mouse to click through the prototype like a real user. “Do I have to create a share link to test the prototype?”. Of course not! You can test the prototype to make sure that all of the screens are linked up properly at any time — simply hit the “Desktop Preview” icon (the play icon) and click away. If it’s just you, Desktop Preview is more than ideal. Quick-tip: you can even record yourself using the prototype — just hit the record button in the Desktop Preview window! Note: hotspot hinting allows the testing user to receive additional help when navigating the prototype — this is useful for incomplete prototypes, however, complete prototypes should have hotspot hinting disabled to offer the “real” experience. Great, we’re almost there! Now let’s assume that we’ve received some feedback and that our concept has been somewhat validated in a realistic environment (i.e. in a real device using Device Preview). Switch back to the “Design” workspace and use the inspector on the right-hand side to apply any visual aesthetics (opacities, fills, borders, shadows, corner radii, etc) to the layout (that is, after making any initial layout adjustments in accordance with the feedback). 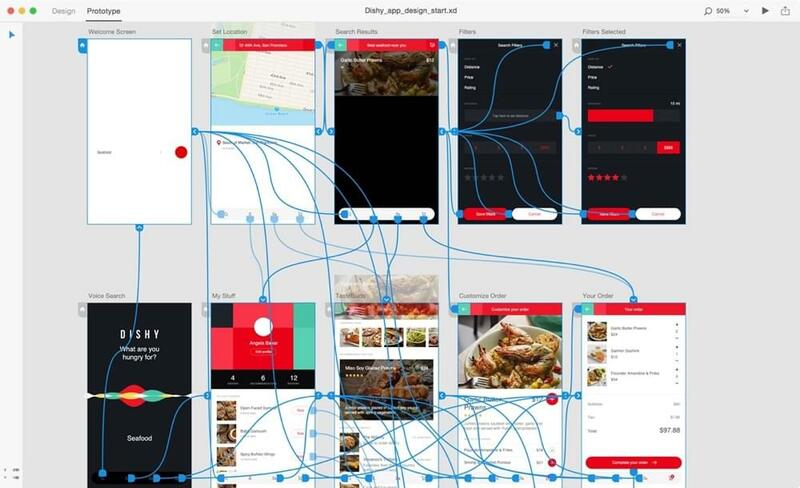 High-fidelity prototyping is usually the most time-consuming aspect of designing user interfaces, but there are ways that we can drastically speed up this workflow. Firstly, there’s Repeat Grids, which allow us to tile components horizontally and/or vertically and keep them visually consistent, although with completely unique content, which can be dragged and dropped right in (i.e. if you drag 4 images into the grid at once, Adobe XD will intuitively distribute one image to each tile in the grid!). Click “Repeat Grid” in the inspector to begin (or use the keyboard shortcut: ⌘/Ctrl + R), then use the draggable handles to tile the component horizontally or vertically (vertically, in this case). Secondly, there’s symbols, which allows you to keep certain components visually consistent when the various instances are scattered over multiple artboards. When you change one instance of a symbolled component, they all change, achieving visual consistency and saving you bundles of time. If you’ve used Sketch before, you’ll be very familiar with the use of symbols. When you have a component that you know you’ll use over and over again, select it and use the keyboard shortcut ⌘/Ctrl + K to turn it into a symbol; then, later on, you can switch to the symbols list (⌘/Ctrl + Shift + Y) and drag one instance of that symbol into the artboard. What else can I say? Give it a try! It’s still free! Convinced, but need a guide to getting started? Check out Jump Start Adobe XD. Buy the ebook for $19 or sign up as a Premium member. You can also grab a physical copy via O’Reilly.